The shared podium on each cluster will include community facilities, retail areas and dining outlets. Enabling works on Phase One of the first residential development within Abu Dhabi’s Saadiyat Cultural District are due for completion this month (September), with the early works contractor having already excavated more than 105,371 cu m of earth to make way for the project. 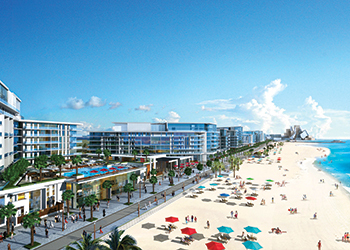 The first phase of Mamsha Al Saadiyat mixed-use project on Saadiyat Island in Abu Dhabi includes three clusters – Azure, Lilac, and Turquoise – that feature low-rise buildings and a shared podium on each cluster that will include community facilities, retail areas and dining outlets. This phase is scheduled for completion in three years. In all, Mamsha Al Saadiyat comprises five clusters, each approximately 250 m long. The remaining two clusters will be developed in Phase Two and will contain dedicated serviced apartment buildings, a retail village and a headland park. The Tourism Development and Investment Company (TDIC), the master developer of the project, will oversee all work on the project, from design to construction, to ensure that its vision is delivered to its high quality standards. “Currently, early work construction is being undertaken on site, with more than 105,371 cu m of earth excavated to lay the foundation,” Amna Al Alkeem Al Zaabi, assistant development manager of TDIC, tells Gulf Construction. Additionally, piling and shoring works are also under way. The contract for the enabling works was awarded in March to Nael and Bin Harmal Hydroexport (NBHH). While work on the foundation commenced on March 15, 2015, work on the superstructure is expected to start before the end of this year. Mamsha Al Saadiyat is envisioned to be a lively, mixed-used community that features luxurious beachfront residences with access to diverse retail, dining and entertainment features along the beach and the world-class museums in Saadiyat Cultural District. 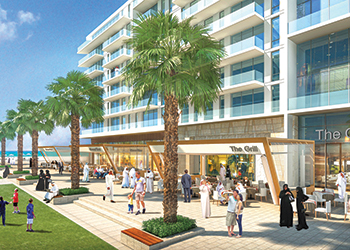 The architectural concept is for meandering, low-rise apartment buildings stretching for over 1 km along the newly constructed extension to Saadiyat Beach, overlooking a promenade featuring ground-level cafes, restaurants and retail outlets. The apartments have fully-glazed facades with openable windows and external balconies, terraces and gardens, and are organised to maximise views of the beachfront and Saadiyat Cultural District. In addition to apartments and duplex penthouses, the development’s architectural mix includes two-storey townhouses at street level, with private gardens and direct access to the communal pool terrace. Mamsha Al Saadiyat’s enviable location means that residents can also take advantage of the easy access to world-class museums in Saadiyat Cultural District – Zayed National Museum, Louvre Abu Dhabi and Guggenheim Abu Dhabi – as well as The District, a premier retail destination that is being developed in partnership with L Real Estate (LRE), a global real estate development and investment fund sponsored by the French luxury goods brand LVMH. Meanwhile, Guggenheim Abu Dhabi will offer a dramatic focal point at the west end of the development. Residents can also take advantage of its proximity to Manarat Al Saadiyat, a key exhibition centre and the UAE Pavilion, as well as Cranleigh Abu Dhabi, the leading British-curriculum school. Furthermore, both the Beach District, with its high-end residential, hospitality, leisure and retail offerings, and the Marina District – currently home to New York University Abu Dhabi – are located nearby. 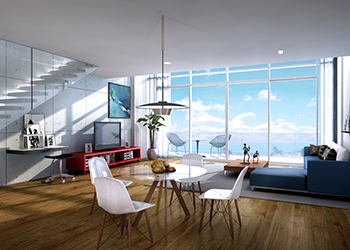 Each unit features floor-to-ceiling windows that offer expansive views. The three plots being developed under the first phase contain nine low-rise residential buildings with a total of 461 apartments, 414 of which range from one- to four-bedroom apartments and five-bedroom duplex penthouses, between 106 to 454 sq m in area and 47 townhouses with two to three bedrooms, ranging from 227 to 315 sq m in area. Each of the developments – Azure, Lilac and Turquoise – comprises three buildings accommodating 24 to 79 apartments per unit, with two swimming pool terraces, state-of-the-art gym (in each), dedicated parking for residents, and a podium featuring leisure, retail and dining areas and dedicated play area for children. There are nine penthouses located throughout Mamsha Al Saadiyat attesting to the elite lifestyle envisioned for their homeowners. Each penthouse features a private swimming pool and terrace as well as a modern kitchen, two living rooms and a dining room. In addition, there are a maid’s room and a driver’s room. The 47 townhouses available for prospective residents – 22 in Azure, 14 in Lilac and 11 in Turquoise – are located on the ground floor of each building. They also feature a modern kitchen, living and dining rooms as well as a maid’s room. Some townhouses will also have a roof garden that offers direct access to the podium. Mamsha Al Saadiyat boasts a central retail village offering approximately 5,000 sq m of leasable area, for both retail and dining outlets. The outlets are situated around a plaza that benefits from spectacular views across the water to the Guggenheim Abu Dhabi. Other key community elements include an open grassland plaza with wraparound retail and dining outlets, a headland park located at the western end of the promenade overviewing the Guggenheim Abu Dhabi and a pier that stretches approximately 200 m into the sea. These offer pedestrian gathering locations with dramatic views of the museum and all of Saadiyat island. Mamsha Al Saadiyat utilises a range of sustainable elements through the development, which has earned it a Two Pearl design rating certificate, awarded by the Urban Planning Council (UPC) as part of its Estidama Pearl building rating system. These elements include white render and glass handrails, along with floor-to-ceiling windows that maximise on natural light, in addition to specially-chosen façade options that minimise the impact of the sun both for energy savings and human comfort. The landscape features indigenous planting selected for their resilience and low water consumption, and shading elements designed to enhance the quality of outdoor space. The project is very much about outdoor living. Designed by RTKL, the development features modern, crisp, clean architectural designs, drawing inspiration from the azure waters of Saadiyat as well as the current vibrant residential communities in the Beach District. The structures within each cluster will incorporate specially chosen materials in a variety of colours that best reflect their design. They range from various metallic panels to rough-cut stone to slate to 3D-created textures in different designs, and more. In line with the high priority accorded to the safety of residents and visitors, all fire and safety systems are aligned with international best practices as well as the requirements of Abu Dhabi and the UAE. In addition to the fire and life safety systems, the development comes within the remit of the Saadiyat Cultural District’s security masterplan. Residential and visitor parking is located underground, with access from the southern boundary road, which will also incorporate bus stops once completed. Overall, the public realm has been designed to encourage residents and visitors to pass between buildings and along the promenade using shaded walks and gathering spaces. There is also a 6-m-wide pedestrian footpath with stepped access to the beach that can also be used by recreational cyclists. Mamsha Al Saadiyat features extensive landscape areas and incorporates indigenous vegetation, efficient irrigation systems and external shading within the public realm. “The most outstanding feature of the project is undoubtedly its location, with uninterrupted views over the Gulf and Saadiyat Beach. Moreover, residents, visitors and guests will also be able to enjoy various community elements featured within Mamsha Al Saadiyat, which include a headland park and a 200 m pier,” says Al Zaabi. The project’s proximity to the beach has meant that complex protective measures have to be taken to ensure the safety of excavations and construction work near the open sea, in a saline environment, with extreme exposure to the sun, without disturbing the Saadiyat environment. TDIC’s team on the project include RTKL (with Dewan Architects and Engineers as architect of record) as lead consultant, EC Harris as client’s representative and RTKL as its assistant, with NBHH as the early works contractor. The main contractor is yet to be appointed.